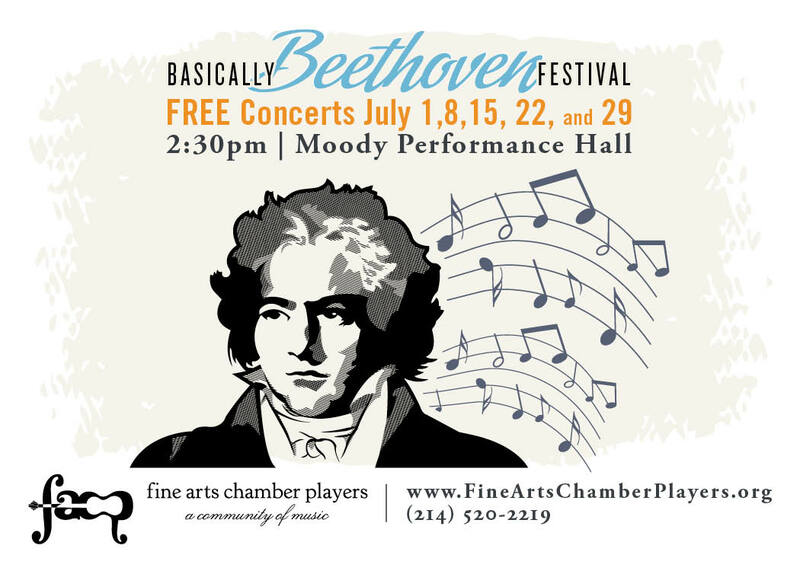 Audiences at the first concert of the 2018 Basically Beethoven Festival will hear the World Premiere of Quinn Mason’s String Quartet No. 5. Mr. Mason is quite an accomplished composer, regardless of his young age. He grew up in Dallas and graduated from North Dallas High School. 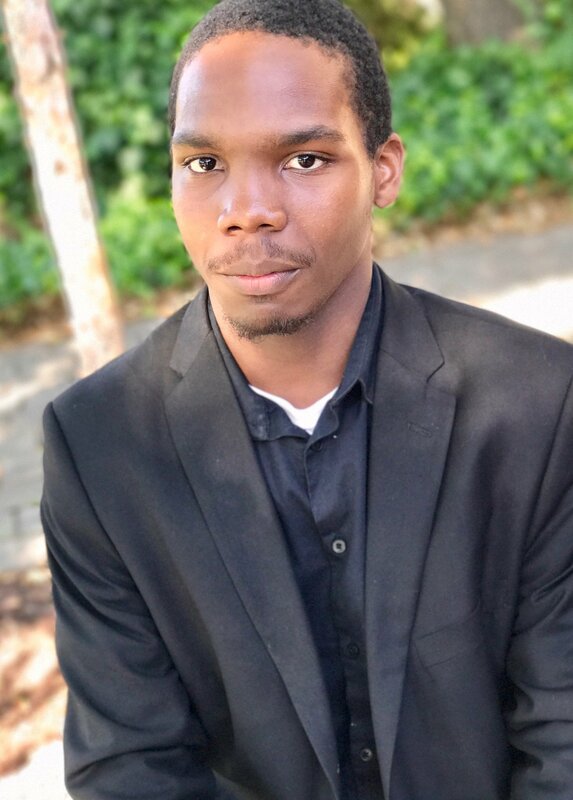 He first became acquainted with Fine Arts Chamber Players through an in-school demonstration by one of our troupes, and eventually was part of our scholarship program for private lessons. Enjoy this interview with Mr. Mason to learn more about his process for composing, his history (including his first time in the audience at the DSO with rock star Sting on stage), and his interests. Why was the String Quartet No. 5 selected for this concert? This one is a representation of my current style. I’d say it marks the emergence of the compositional voice that I experiment with today. The fourth movement of this quartet has been performed before, but this is the first time the entire piece has been performed in public – it’s a World Premiere. How old were you when you started playing an instrument? When you started composing? When I was 10 I started piano classes at my elementary school. That led to an interest in exploring music more. I took private lessons and had extra practice on the keyboard after school. That led to improvising, exploring, and creating music. After piano, I started the cello about 2 years later; and I did the recorder at school. Cello was my first experience playing with an ensemble through orchestra, the New Conservatory of Dallas. In high school, North Dallas High School, I joined band for the first time in the percussion section. I was 10, actually, when I started composing. I even drew my own staff paper for my earliest pieces! Can you walk us through your process of how you compose a piece? Sometimes the idea comes first, sometimes the rhythm comes first. I’ll take all the ideas and put them in a little black notebook I keep. Eventually, I’ll put all the notes together and order them. Then one idea – a theme – will come to the forefront and I might voice that with a particular instrument, then fill out the other sections … essentially, it’s taking ideas and shaping them into a larger picture. When did you decide to pursue a career as a composer? In high school. It was my band director Mr. Warmanen who encouraged my composition by letting me composer for the band and letting me compose my own pieces for the band. And this was after I’d taken some time off from music in middle school. What type of music did you listen to as a kid, and what do you listen to now? My mom brought me up on ’80s and ’90s music, mostly R&B and hip-hop. So, classical music was something I had to seek out on my own through the radio. I still listen to classical music, but I’ve recently gotten into salsa music and Latin music, in general. Growing up in Dallas, what were some arts organizations you interacted with? 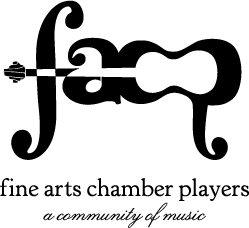 FACP – I was a scholarship student and received free cello lessons in elementary and middle school. Once I left the cello, FACP was able to facilitate composition lessons for me. I grew up in the audience at the DSO. First performance was seeing Sting in Peter & the Wolf at the DSO. I still remember that! That was a school trip. Who’s your favorite composer to listen to? Igor Stravinsky is my favorite of all time. It used to be Tchaikovsky, but once I heard “Rite of Spring, I thought – this is my man. The reason why I like Stravinsky so much is because he experimented with different styles, but he always sounds like himself at the same time. That’s unique and inspiring. What advice would you give 14-year-old Quinn? You’re not going to be an actor, stop writing screenplays. Practice more piano, listen to a lot more contemporary music because it’ll really open your mind. And, just be yourself – don’t try to be someone else. What advice would you give a high schooler who wants to pursue music in college? Make lots of friends and be very social because music is a universal experience and very collaborative. Be nice to everyone and don’t burn your bridges – those connections can really help you in college and in your career. What’s your favorite sound (musical or non-musical), and your least favorite sound (musical or non-musical)? Favorite sound – I’d have to say the sound of an orchestra tuning up. It’s very refreshing to hear lots of open strings and warming up. Least favorite sound – when people clap after the third movement of Tchaikovsky’s Symphony No. 6. When you leave this world and reach the pearly gates, what celestial concert do you hope to hear? I want to hear Stravinsky conduct his own “Rite of Spring.” That’s what I really want to hear. answered these questions for FACP’s discerning audience. 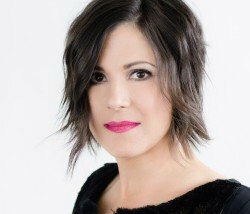 Kim, with soprano Lindsay Kesselman and pianist Midori Koga as Haven Trio, performs at our upcoming Bancroft Family Concert series at the Dallas Museum of Art’s Horchow Auditorium on November 12. Doors open at 2:30 for the 3:00 concert. As always, the concert is free. The program boasts the WORLD PREMIERE of Jon Magnussen’s TWINGE, songs inspired by survivors from the 2004 Indonesian tsunami. Haven Trio and Jon Magnussen received a grant from Chamber Music America for him to compose this song cycle specifically for you three musicians. What was that process like? Did Jon present it to you as a finished work, or was there some back-and-forth? One of the really fun parts about working with living composers is that it truly becomes a collaborative process. Jon heard our performances and knew what our collective and individual strengths were, so he had that in mind as he wrote. If he had a question about something or wasn’t sure if it would work, he asked us. We met in August to play through the work for the first time, and after that, Jon made a few more adjustments. Haven Trio is described as “a refuge for the creation of new music for soprano, clarinet, and piano.” How did you come to focus on contemporary chamber music? We all love all styles and genres of music, but I think it’s fair to say that we all like the process of bringing a piece to life from the initial stages of working with composers in composition, to performing the work, to introducing audiences to contemporary works. We tend to perform music of composers who know us well and are not afraid to tell us exactly what their vision of a work is. These same composers also know our strengths and can, therefore, write well for us. In our careers, we have found that listeners may be ‘scared’ of contemporary music. Ideally, we want to create music and present it so that audiences feel connected to the music. You live in the Dallas area, but Lindsay is in North Carolina and Midori lives in Canada. How did the three of you meet and form Haven Trio? How do you work on music together? Is there a lot of traveling, or do you Skype? Well, it is a long story of how we met! Midori and I played together in a different contemporary music group for over 10 years when we both lived in Michigan. After that group stopped performing, Midori and I continued to perform, but she was in Toronto by that point. (Michigan and Toronto—still not so far apart.) Lindsay, Midori, and I then began to collaborate when Lindsay and I taught at the same institution in Michigan. We found we really had terrific chemistry, a similar outlook in our approaches, and we really love performing together. Even when new jobs and life decisions drew us to geographically distant places, we wanted to continue collaborating. Typically, we do 10-day “residencies” twice a year when we come together for a series of concerts in a single location. We do some Skype-type work, but we also do lots of recording of our own parts that we send to each other for help in preparation. When we arrive in the concert place, we have time to rehearse, but since we’ve recorded and listened lots to each other’s parts by that point, we can get right to music-making and interpretive decisions. Do you find that being a teacher influences you as a performer? If so, how? I tell my students, “Teaching educates my performance; performing educates my teaching.” I couldn’t imagine doing one without the other. If I am guiding my students to reach musical decisions or to incorporate certain ideals or aesthetics for effective performances, I am reminded that I must always do the same! How old were you when you started playing the clarinet? Why did you choose it? I started playing the clarinet in my public school band program in New Mexico when I was 8 years old. I am grateful to my band directors—I wouldn’t be a musician today were it not for their guidance. I was lucky to begin private lessons when I was 12 years old. I hate to say it, but I chose clarinet because my older sister played flute! I didn’t really know enough to have a good reason to pick it! However, I truly love the clarinet sound and color—I can’t imagine playing any other instrument at this point. What types of music do you like to share with your kids? What type of music do they like? We listen to all kinds of music at home. Honestly, my children prefer popular music to classical, but both play instruments and have studied music their entire lives. When I’m not teaching or playing, I typically listen to something other than classical music (since that’s what I hear almost all day). I love jazz and world music—especially Brazilian music. Who’s your favorite composer to listen to? To play? Whatever composer’s music I am currently working on. Truly, I don’t have a favorite—there is so much wonderful, moving music! What’s your favorite sound (musical or non-musical)? Least favorite? I love sounds of nature—waterfalls, birds singing, wind rustling through trees, rainstorms. Least favorite? Fingernails on a chalkboard. Once you leave this world and reach the pearly gates, what celestial concert are you looking forward to? That’s a tough choice! If it were possible to hear the premiere (or one of the original performances) of Beethoven’s Symphony No. 9, that would be amazing, I’m sure. But I wouldn’t say no to Bach at the organ… or Mozart at the piano. 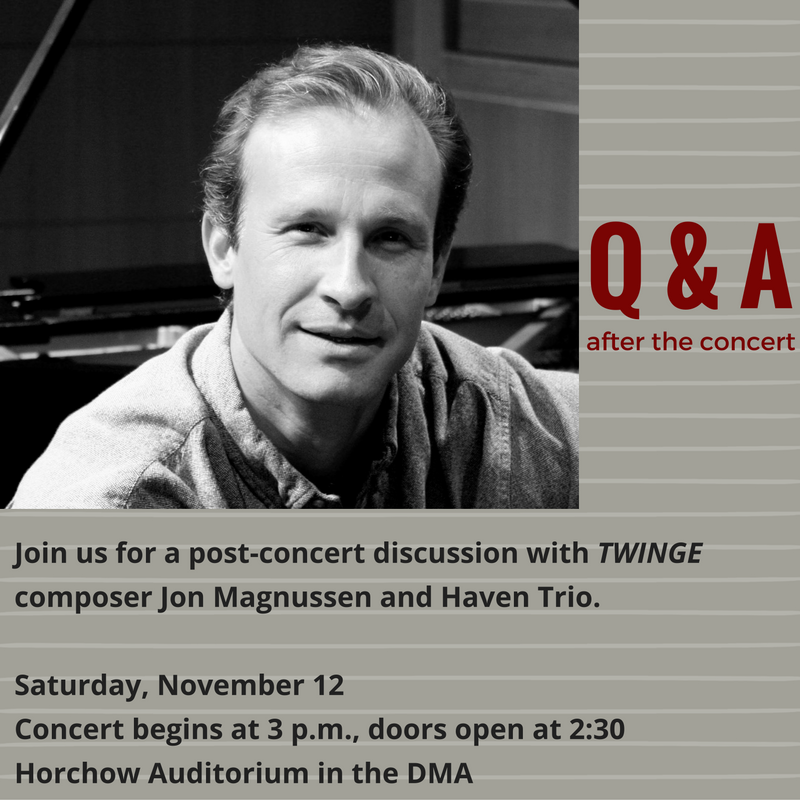 Part of our free Bancroft Family Concert Series, Haven Trio’s WORLD PREMIERE of Jon Magnussen’s TWINGE, songs inspired by survival tales of the 2004 Indonesian tsunami, takes place on Saturday, November 12. Held in the Horchow Auditorium at the Dallas Museum of Art (1717 N. Harwood Street, Dallas 75201), the program begins at 3 p.m. with doors opening at 2:30 p.m. The concert is FREE TO THE PUBLIC with no tickets required. PLEASE NOTE: the multimedia performance includes tsunami-related imagery which may contain strong thematic elements. Audience discretion is advised, particularly for families with young children. 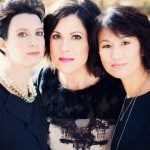 Haven Trio (Professor of Clarinet at University of North Texas Kimberly Cole Luevano, soprano Lindsay Kesselman, and pianist Midori Koga) and Magnussen received a grant from Chamber Music America to commission the composer to write the piece for the trio. Several years before, Magnussen had read Barry Bearak’s New York Times magazine article “The Day the Sea Came” about the stories of survivors of the 2004 Indonesian tsunami. He was so moved that he knew he would someday set the stories to music: this has become TWINGE.